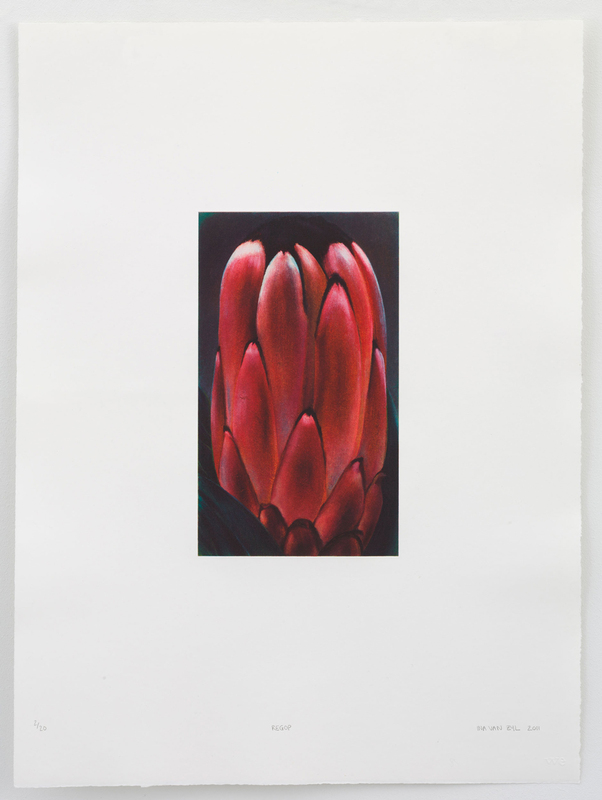 “Regop (translated ‘Up Right’) is made after my painting entitled Protea Erectus form 2010. The thought of a Protea, like everything else I paint, strongly fills me with a combination of repulsion and attraction; beauty and disgust. These opposite forces reside in all my work. Imploded and isolated from its usual context. My paintings are, as my charcoal drawings, saturated. Almost suffocated by the amount of paint and color, the canvases are densely covered from corner to corner. I aimed at obtaining a similar density and point of saturation producing this photo polymer Regop. Flowers, fruit, portraits, and parts of the human body, like hands, toes andsexual organs are some of the things I depict in my work. In a process steered by my visual interest, fed by longing, memory and association, I try to provide meaning to objects of no value. Following the example of Giorgio Morandi, I try to show the abstraction of reality. I try to portray everything as objectively as possible. Ina van Zyl (Ceres, 1971), lives and works in Amsterdam, Netherlands, studied graphic design and fine art at Stellenbosch University. As a student she was a regular contributor to Bitterkomix during its early days. She graduated in 1994, majoring in drawing. Ina first visited Amsterdam in 1995 as a guest of the Thami Mnyele Foundation. She consequently moved there to study at De Ateliers (1996-1998) and continues to live and work in Amsterdam. During her residence at De Ateliers, Ina started to paint. She has been awarded several prizes for painting since. Her work is represented in various collections – both private and public. She regularly exhibits in The Netherlands and abroad. Three monographs on Ina van Zyl’s work have seen the light, with texts by Dominic van den Boogerd (director De Ateliers, Amsterdam), Rudi Fuchs (former director Stedelijk Museum Amsterdam), Gavin Jantjes (curator at the National Gallery of Art, Architecture and Design, Oslo) and Ernst van Alphen (professor of Literary Studies at Leiden University). Monographs are available from Warren Editions.